This spring, orange goop appears to be taking over the Juniperus virginiana ‘Burkii’ in the BioStream. During damp springs, cedar quince rust (Gymnosporangium clavipes) produces cushion-shaped, orange, gelatinous blisters through the bark where the branches are swollen on cedars and junipers. This fungus has a two-host lifecycle. A few hours of wet, cool (74 to 78 degrees F) spring weather are sufficient for telial swelling on the juniper and the release of basidiospores. These basidiospores travel to the second host, members of the rose family including quince, apple, crabapple, and hawthorn. There they infect stems and fruit, producing tiny black dots within a few days. Four to seven weeks later, in late summer/early fall, aeciospores become airborne and infect cedar or junipers again. 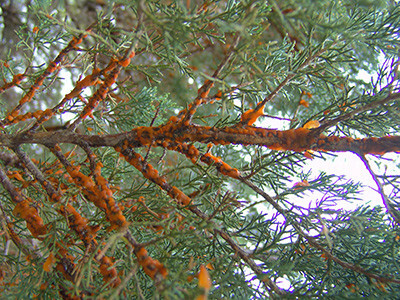 Aesthetically this rust can cause some dieback on the junipers and cedars. Co-exist with the disease. We typical live with the plant and some orange goop in the spring if the infection is minor. Avoid planting susceptible plants together. Unfortunately in the BioStream, we have Juniperus virginiana (particular susceptible species) and a hawthorn with the quince collection all planted within wind distance. Select resistant varieties. If you are not comfortable with the damage being caused, remove the diseased plants and select cultivars for rust resistance. The cedar-quince rust galls may remain infectious for 4–6 years or more (up to 20). The infection cycle only appears when wet conditions are just right. Some years the symptoms do not appear at all. Thus, we just live with a little bit of orange goop in the spring. As we progress into the hot temperatures of summer, the goop will dry up.